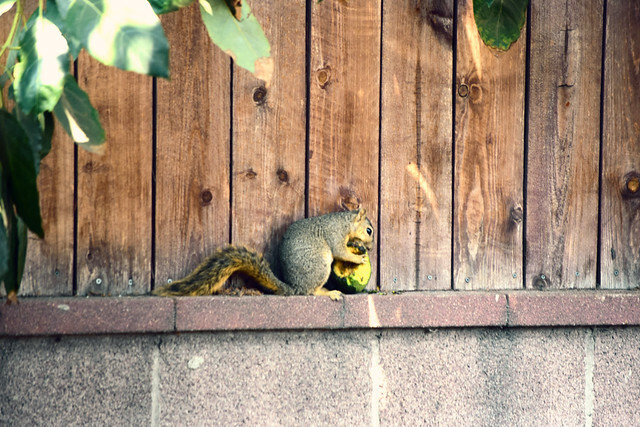 I heard some chattering in my backyard recently and when I looked out the back door I saw this squirrel chewing on an avocado almost as big as he was. He ate for a few more minutes and then dropped it on the ground. He didn't bother to throw his leftovers in the trash. I googled "squirrels in downey" and found this interesting article about a transplanted squirrel species, the Eastern fox squirrel, that is affecting the native Western gray squirrel population. I think I'm harboring a member of the invasion army. Excellent photo. I hope your tree provides plenty of avocados for you and not only for the invading squirrels!